Easy to make and creates its own sauce as it cooks. Preheat the oven to 200C, gas mark 6. Mix together the oil, honey, soy, vinegar, orange zest and juice and season. Pour mixture over the chicken thighs and leave to marinate in the fridge for 30 minutes, turning once or twice (longer if you have time). Remove the chicken from the marinade and arrange in a roasting tin so that the thighs are in a single layer without much space between them. Pour over the marinade and roast in the oven for 30–35 minutes, basting regularly until the chicken is tender and golden and the juices run clear when pierced with a skewer. 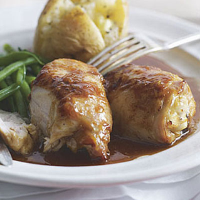 Serve with baked potatoes and green beans and the pan juices spooned over. Rustenberg Chardonnay, Stellenbosch, South Africa, brings brilliant apricot and orange peel aromas supported by fantastic body and brilliant balance.